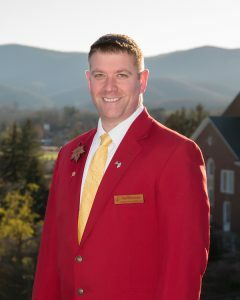 The Mountain State Forest Festival Board of Directors announces the appointment of Chad Shoemaker as Director General of the 81st Mountain State Forest Festival. The annual fall celebration is scheduled to take place September 30-October 8, 2017. The Forest Festival is the state’s oldest and grandest running festival and a premier mountain event annually attracting tens of thousands of visitors for a regal celebration. Director General Shoemaker has themed this year’s festival, “FALL into Autumn Traditions”. With plans to carry on deeply-rooted festival customs of the past with a twist of new “FALL into Autumn Traditions,” festival goers can expect an exciting 81st Forest Festival. Shoemaker, along with his assistant director team, Executive Director Breanna George and the Board of Directors has been behind the scenes planning for the execution of this year’s celebration since the beginning of the year. Co-owner of Elkins Physical Therapy & Sports Injury, Clinic, Shoemaker works as a Physical Therapist Assistant. He serves as Board president of the Elkins-Randolph County YMCA and is a member of the Beverly chapter Tygart Valley IOOF Lodge 66 and Elkins-Randolph County Chamber of Commerce. Serving as team captain of Relay for Life of Randolph County, he also mentors for the Randolph County Vocational Technology Center’s DCT (Diversified Co-Op Training) Program. Married to Christie Shoemaker, he and his wife have two daughters, Sara and Sophia. A 1992 graduate of Elkins High School, he graduated from both Davis & Elkins College and Fairmont State College.